Wow, this made me feel as if I was falling over, incredible POV! I really like this. The angle is great! Amazing perspective and the composition really pulls you in, great angles. 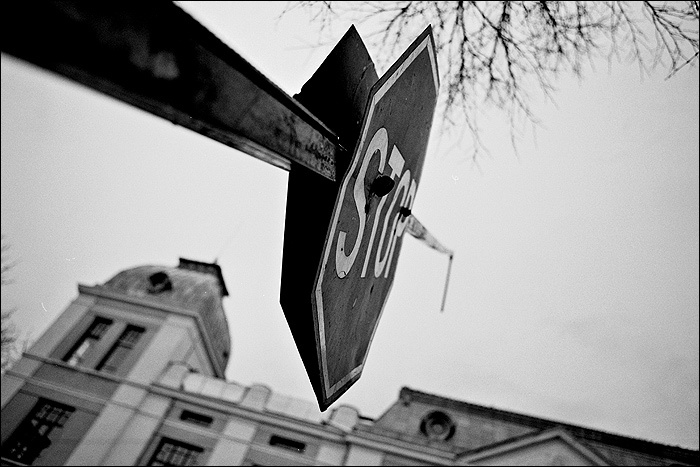 Nice perspective but I believe it’s over toned.There is a slight halo around the stop sign. Brad, over-toned in B&W? Well it’s just a bit over-sharpened, it was too soft when scanned from the film so I do applied a bit of sharpening which led to the halo around the stop sign. It’s not that it’s not a nice picture. The only reason I can even see a halo, or the only reason it bothers me, is because the building fades, which makes it seem overworked. Wasn’t trying to offend you, pal.